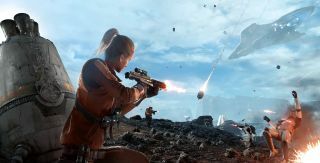 Star Wars Battlefront will use a "two-tier currency system" of points and credits, which sounds like the sort of thing that inevitably leads to microtransactions. This is especially true since, as GameSpot explained, credits are used to acquire better, deadlier weaponry as you struggle to free the galaxy from the Empire's black-gloved grip (or, uh, look to tighten that grip, if you're playing on Team Dark Side). But design director Niklas Fegraeus says that's not going to be the case this time around. "The currency system is based on your game performance. The credits that you use to buy things in the game are earned. You play the game, complete challenges, and that's how you get credits," Fegraeus said. When pressed, he emphasized that the only way to earn credits, "absolutely," is through playing the game. "[Microtransactions are] not part of the core design of how it works," he said. "This is a progression system based on your gameplay performance." To which I say, good! I'm not one to believe that microtransactions are inherently evil, but I do think that they're appropriate primarily for free-to-play games, and not those for which I pay $70 plus applicable sales taxes. We talked with Fegraeus recently about why the studio opted to forgo a server browser in favor of a matchmaking system. (The answer will shock you!) Star Wars Battlefront comes out on November 17, but the beta—open to all, don't forget—begins in just a few days.